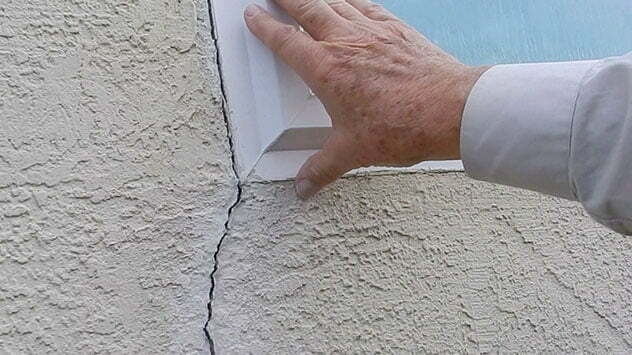 It’s important to seal cracks in stucco immediately to prevent further damage. Homeowners often choose wood, brick or vinyl siding for its appearance and durability. Stucco — which is made from a mixture of sand, cement, water and lime — is another option. It has numerous benefits; many homeowners find it aesthetically pleasing, and if maintained well, stucco can last up to 50 years. However, like any type of siding, stucco is vulnerable to impact damage and settling. Though some damage is inevitable, fortunately, you can repair and seal cracks and holes in stucco. Now, let’s fix that stucco! Break away any deteriorating concrete and remove loose material with a brush. Hello, I have a big piece right in front of my house that fell off about 2 mos after I bought it! Its right under my front window, almost like a shelf but made for that, also seems it was “fixed” before & it just didn’t last. Its made out of stucco & Styrofoam. I was told to use construction type glue & that will hold it forever. It looks terrible but I’m worried that I cant fix this myself. I was quoted many different prices & I don’t “trust” anyone. Any advice you can give me would be greatly appreciated!! Love your website, keep it up!! Hi, Diane! We would need to know more information, please. You said the crack is coming from a basement window — are you saying the window has a gap or an unwanted opening? Or is the crack located somewhere else, and if so, what type of siding is on the home? We have a small crack on the outside of our home coming from a basement window into the concrete base of the home. It’s apx 1/4″ and we need to know how we can repair this ourselves?